Evaluation of fitness differences between herbicide-resistant and susceptible weed biotypes, allows a better prediction of further dispersal of herbicide-resistance populations and the design of a management strategy in order to achieve a mitigation of the problem in the absence of herbicide. In this study, an evaluation of germination and seedling emergence characteristics of three rigid ryegrass biotypes (one susceptible and two resistant populations with different mutations, namely Ile 1781 Leu and Ile 2041 Asn) and of competition between this weed and wheat using replacement series experiments was conducted. The results showed that when seeds were on the soil surface (0 cm) to depth of 2 cm and again for the depth of 6 cm, there were not any significant differences between the biotypes regarding seed germination percentage. On the contrary, when seeds were sown in 2–4 cm depth, R-1781 consistently displayed lower emergence than the S and R-2041 biotypes. Moreover, when seeds were sown at 8 cm depth, final proportions of emerged seedlings were similar for R-2041 and R-1781, while both populations had significantly higher emergence than the S population. The competitive ability of the three biotypes was similar, as determined by a replacement series experiment with wheat. Our results under competitive conditions revealed that Triticum aestivum was more competitive than Lolium rigidum. Overall, there was no apparent fitness penalty associated to ACCase-inhibitor resistance, while different mutations may impose different competitive ability and therefore require case-specific management strategies. Acetyl-coenzyme A carboxylase (ACCase) inhibitors consist a group of commercially important, very effective and, selective graminicides which are applied postemergence and introduced since 1970s. These herbicides are members of the Group A (1) of herbicides (Mallory-Smith and Retzinger, 2003; Anonymous, 2004). By inhibiting ACCase activity, fatty acid synthesis is also inhibited, resulting in growth cessation in meristematic tissues and finally plant death (Délye, 2005; Powles and Yu, 2010; Ahmad-Hamdani et al., 2012). The extended and worldwide use of ACCase inhibitors has resulted in resistance evolution in about in 48 different weed species (Heap, 2016). It has to be noted that the first reports of resistance to these herbicides have been reported more than 30 years ago (Heap and Knight, 1982). An important mechanism that induces ACCase herbicide resistance in grasses is target site mutation (Délye, 2005; Powles and Yu, 2010). Nine distinguished aminoacid replacements in the CT domain of plastidic Acetyl-COA carboxylase genes have been identified to cause target-site resistance to certain ACCase inhibiting herbicides in grass weeds (Délye et al., 2005; Powles and Yu, 2010; Collavo et al., 2011). Target site resistance is probably due to critical changes in the optimal binding of the herbicide. Six mutations in the gene encoding ACCase in rigid ryegrass (Lolium rigidum) were shown to confer resistance to herbicides inhibiting this enzyme. In particular, they cause amino-acid substitutions at codon positions 1781 (Ile-to-Leu), 2027 (Trp-to-Cys), 2041 (Ile-to-Asn), 2078 (Asp-to-Gly), 2096 (Gly-to-Ala), and 1756 (Gln-Glu; Zhang and Powles, 2006). Powles and Yu (2010) declared that resistance level depends on the herbicides, rate, weed species, and number of resistant alleles in individual plants. Menchari et al. (2008) reported that diversity fitness costs could be connected to mutant ACCase alleles. Fitness can be defined as the ability to reproduce to the next generation. Regarding herbicide resistance (HR), fitness costs can help illustrate the relative abundance of resistance alleles (Menchari et al., 2008; Vila-Aiub et al., 2009). 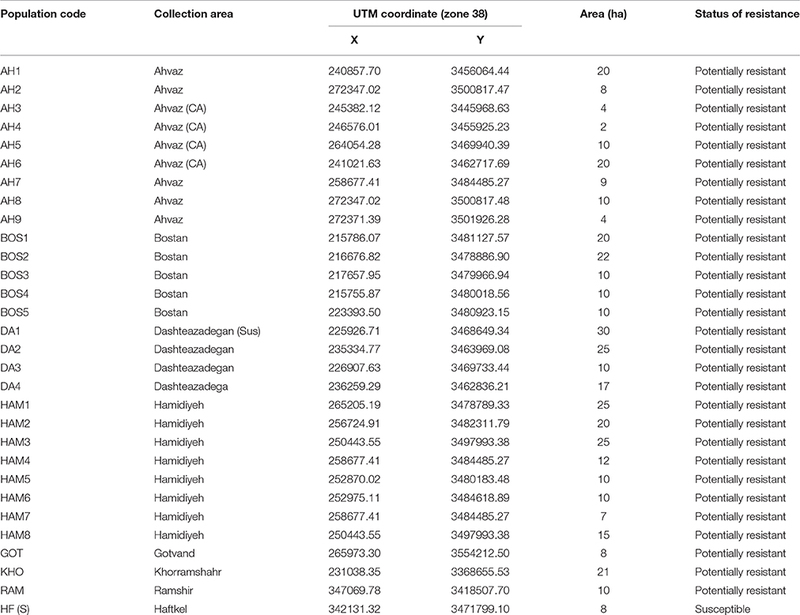 Fitness costs observed in weeds resistant to herbicides because of some mutations have been reported to be lower (Beversdorf et al., 1988; Darmency and Pernes, 1989) or even higher that 25% (Tardif et al., 2006). Some resistant biotypes of rigid ryegrass were also shown to be more competitive in terms of seed size compared to the susceptible population (Pedersen et al., 2007). Travlos (2013) showed that there were not any significant fitness differences between ACCase-inhibitor resistant and susceptible biotypes of sterile wild oat (Avena sterilis). Fitness costs play a significant evolutionary role contributing among the others to the maintenance of genetic polymorphism within populations (Yanniccari et al., 2016). However, even if fitness costs associated with plant defensive traits are widely anticipated, they are not commonly detected (Van Etten et al., 2016). Hence, the main purpose of the present study was to compare the competitiveness of a susceptible (S) rigid ryegrass biotype, compared with two resistant (R) biotypes, in terms of several growth parameters. Moreover, 30 biotypes were exerted to determine the possible pleiotropic effects of R-1781 and R-2041 ACCase alleles in greenhouse conditions, in competition with Triticum aestivum. Such data could be useful in order to understand fitness cost's sides and implement the optimal resistance management strategies. Seeds used in the present study were collected in the spring of 2013 from 29 wheat fields infected with rigid ryegrass and located in the southwestern part of Iran (Khuzestan province) (Table 1). In the specific area, there were often complains on the low efficacy of ACCase herbicides, while there were several reports of herbicide resistance development. Seeds were mainly collected at the beginning of maturity from herbicide-treated wheat fields along with some fields that had never been treated with herbicides (in order to use them as susceptible). Each surveyed field was walked through by the two diagonals seeds were separated, air-dried, and stored at room temperature (22–26°C) until their use. Rigid ryegrass seeds were treated with 10 ppm of gibberellic acid (GA) at 5 days before sowing, in order to relieve any seed dormancy. Table 1. List of potentially resistant and susceptible (S) ryegrass populations to ACCase inhibitor herbicides obtained from Khuzestan area, Iran. Ten germinated seeds of the potentially resistant and susceptible populations were sowed in pots filled with 500 ml of soil. An herbicide-free soil mixed with a common peat substrate (1:1, V/V) was used. Throughout the experiments the pots were uniformly watered as needed. Shortly after emergence, plants were thinned to a final density of seven seedlings per pot. The pots were fertilized as required and kept under conditions set at 20–30/10–15°C day/night with a 14 h photoperiod and a relative humidity of about 65%. The required amount of light was provided by a combination of fluorescent and incandescent lamps. At 21 DAE1 (at the 2–3 leaf stage), seedlings were treated with the recommended dose of clodinafop-propargyl (CLD) and pinoxaden (PIN). Particularly, CLD and PIN were applied at rates of 64 and 45 g ai ha−1, respectively. Plants were harvested at 28 DAT2 and the fresh weight of foliage was recorded, with the number of dead and surviving plants also being measured. After the above-mentioned evaluation of efficacy and potential resistance, the populations were used for leaf sampling and subsequent DNA extraction. Particularly, in a CAPS (cleaved amplified polymorphic sequences) analysis, gene-specific primers were applied to reproduce DNA pattern, and SNPs (single nucleotide polymorphisms) were identified. In the dCAPS (Derived cleaved amplified polymorphic sequences) technique, a limitation enzyme identification site, which contains the SNP, was introduced into the PCR amplicon by a primer containing one or more inconformities to the DNA template. The PCR amplicon is then digested by a limitation enzyme, and the presence or absence of the SNP is defined by the resulting digestion restriction template as previously described by Yu et al. (2008). In this study, the effect of sowing depth on emergence of three rigid ryegrass populations (a susceptible population and two resistant populations) was evaluated. Mean seed weight (MSW) was similar for the three populations (MSW of 1.85 ± 0.25 mg, n = 100) in order to eliminate any side effects. Twenty seeds of each population were sown in 12-cm diameter pots at five depths (0, 2, 4, 6, and 8 cm). Pots were placed in a controlled environment greenhouse with the same conditions as above. The experiment was set up under a completely randomized experimental design with four replicates. Seedling emergence was measured daily for 21 days, while in the case of 0 cm, seedlings were considered emerged when the coleoptile length was 3 mm long (Steadman et al., 2003). Fifteen seeds of each population were sown in a potting soil compound in 12-cm diameter pots. Pots were placed in a controlled environment greenhouse with the same conditions as above and watered uniformly as needed. Shortly after emergence, plants were thinned to a final density of eight seedlings per pot. The experiment was set up under a completely randomized experimental design with four replicates. The experiments were established in October 2014 and 2015. Four wheat and rigid ryegrass plants were harvested at 20-days intervals, from 20 to 160 DAE. Plants were cut in the soil surface and height was also measured. The plants were dried at 74°C for 72 h and dry weight was determined. These tests were conducted in order to evaluate the competitive ability, growth, and seed production of S and R rigid ryegrass populations and wheat under competitive and non-competitive conditions. For that purpose, pot experiments were conducted in the greenhouse of Agricultural Research Center of Khuzestan province, Iran. Seedlings (after seed placement in Petri dishes and their germination) were transplanted into 12-cm diameter pots filled with 500 ml of a manure-loam-sand mixture in 1:1:1 ratio. Competition between rigid ryegrass populations and wheat was studied by means of a replacement series experiment at five proportions (100:0, 75:25, 50:50, 25:75, and 0:100) at a fixed density of 8 plants (ryegrass/wheat) per pot. The pots were kept under conditions set at 20–30/10–15°C day/night with a 14-h photoperiod and watered uniformly as needed. The required amount of light was provided by a combination of fluorescent and incandescent lamps. The experiment was set up in a completely randomized experimental design with four replicates. The replacement series experiment was established on October 2014 and repeated on April 2015. The plants were dried at 74°C for 70 h and weighed. Plants from each species were separated into shoots and spikes, while plant height was also measured at harvest. Differences between seed populations were evaluated after data expression as percentage of the untreated control. The percentage of surviving plants was also recorded at 28 DAT. In Equation (1), y is whole appearance (emergence) on time x, a is the highest emergence (percentage), tE50 is the time to attain 50% of ultimate seedling emergence (day) and b represent the slope around tE50. Emergence values were angular transformed. Parameter estimates were compared by one-way ANOVA and means were separated using least significant difference (LSD) (α = 5%). A similar procedure as the one mentioned above was also followed for the evaluation of competitive ability, growth, and seed production of S and R populations under competitive and non-competitive conditions. Data on plant height and dry weight were subjected to ANOVA. Total shoot dry weight (SDW) was compared with the theoretical yields for equal competitive ability using 95% confidence interval (CI). For this statistical analysis SAS software was used (SAS Institute, 1987). Assessment of herbicide resistance was conducted by means of the rating system given in Figure 1 as described by Moss et al. (1999). The results showed that L. rigidum fresh weight and survival were significantly different between populations at 28 DAT with CLD. Populations AH3, AH4, BOS1, BOS2, BOS5, DA1, DA2, HAM1, HAM2, HAM3, HAM4, HAM5, HAM6, HAM7, and KHO showed the lower fresh weight reduction, while other populations were adequately controlled by CLD. Figure 1. Star (*) and R rating system to distinguish the degree of resistance, according to the response to a single dose of herbicide in resistance screening (Moss et al., 1999). These differences between the several potentially R populations indicate that inadequate control of ryegrass in other locations may be attributed to other reasons like an improper application time or method and not per se to herbicide resistance. The results of our screening tests showed that 10 populations of L. rigidum have resistance to CLD (34.5% of the total). After confirming the resistance of the populations to this herbicide, they have been used for leaf sampling for DNA extraction as described above. Leaves of these plants were analyzed by CAPS and dCAPS methods for identification of possible mutations occurring in 2088, 2078, 2041, and 1781 locations of ACCase enzyme coding gene which is involved in the resistance of L. rigidum to ACCase inhibitors. Finally, there have been recognized two mutations (Ile 1781Leu and Ile 2041Asn) and it was found that the mutation 2041-Asn confers sufficient level of resistance to clodinafop-propargyl. Molecular analyses of resistance confirmed that the Ile 1781 Leu and Ile 2041 Asn mutations in the resistant biotypes endowed resistance to FOPs, but not to DIMs and DEN. 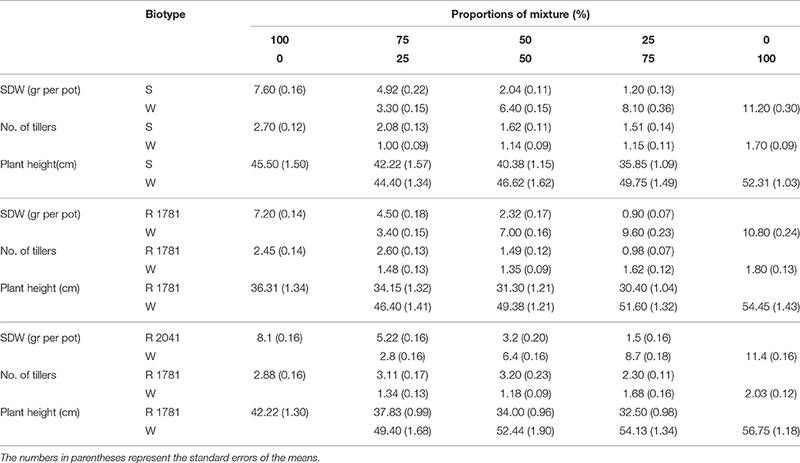 Our results showed that when seeds were placed on the soil surface (0 cm) and in a depth of 2 cm, the S biotype had slightly higher seed germination percentage than the two R populations (2041-Asn and 1781-Leu), but this difference was not statistically significant (Figure 2A and Table 2). In the case of seeds placed on soil surface, seedlings of the R-2041 population had the lowest appearance (83%) compared with populations R-1781 and S (88 and 91%, respectively). When the seeds were sown in a depth of 2–4 cm, R-1781 biotype systematically exhibited lower emergence than S and R-2041 biotypes (Figures 2B,C and Table 2). On the contrary, seeds sown in a depth of 6 cm had a germination percentage of 60, 61.25, and 62% for R-2041, R-1781, and S biotypes, respectively. This finding indicates no-significant difference in the percentage of germination (parameter a) between the three biotypes at this depth (Figure 2D and Table 2). However, when seeds were sown in a depth of 8 cm, final percentage of emerged seedlings was similar for R-2041 and R-1781, while both biotypes had significantly higher emergence than the S biotype (Figure 2E and Table 2). A functional three parameter sigmoid (S) model (equal) presented a significant fit (P < 0.001, R2 = 0.98–0.99) to emergence data for all combinations of population and sowing depth. Values of tE50 were increased with sowing depth (Table 2). R-1781 population exhibited significantly higher tE50 values than the S and R-2041 populations at 0 and 2 cm depths, while R-2041 population had the highest values at depths of 4, 6, and 8 cm (Table 2). Figure 2. Effects of sowing depth on the percentage of seedling emergence of the S (circle), R-2041 (square), and ACCase (triangle) populations. (A) Soil surface (0 cm), (B) Soil surface (2 cm), (C) Soil surface (4 cm), (D) Soil surface (6 cm), and (E) Soil surface (8 cm). Table 2. Parameter evaluation from sigmoidal model that explains the effect of different sowing depth on seedling emergence percentage for the population S, R-1781, and R-2041. In all three populations, increasing depth resulted to an emergence reduction. It has also to be noted that at the depth of 0 cm, the highest germination rate was that of S population (Table 2). Some of these findings are in accordance with similar results obtained in the study of Vila-Aiub et al. (2015b). The results of biomass and plant height data fit to a functional three parameter sigmoid curve for the populations R-781, R-2041, and S under non-competitive conditions as given in Figure 3. The highest biomass and plant height were reached at 80 day after sowing (DAS). Our results showed that biomass of the R-2041 and R-1781 populations was similar to that of the S population. Regarding the maximum dry weight, there were no significant differences (p > 0.05) between the resistant and susceptible populations. As anticipated, the data followed a typical sigmoid growth pattern. Similar results have been found by other researchers on resistant and susceptible populations of weeds like kochia and downy brome (Thompson et al., 1994; Christoffoleti et al., 1997; Park et al., 2004). Concerning plant height, our results revealed some significant differences between the rigid ryegrass populations with S population being significantly higher than R-1781 population (Figure 3). These findings are not in full agreement with results of previous studies (Thompson et al., 1994; Christoffoleti et al., 1997; Park et al., 2004; Menchari et al., 2008). Figure 3. Shoot dry weight (SDW) and plant height of R-1781, R-2041, and S rigid ryegrass populations under noncompetitive conditions. Seed production of the three studied populations was also within a wide range. As shown in Table 3, R-2041 was the population with highest seed production, 19 and 27% higher than the corresponding value for S and R-1781 population, respectively. However, regarding thousand seeds' weight (TSW) there were not significant differences between the several populations. Table 3. Seed production (number and weight) for ACCase inhibitor-resistant (R) and -susceptible (S) rigid ryegrass populations under noncompetitive conditions. Previous studies on several weeds have shown either higher seed production for R compared with the S population (Purrington and Bergelson, 1997; Park et al., 2004), or no differences at all between the several biotypes (Alcocer-Ruthling et al., 1992; Thompson et al., 1994; Travlos, 2013). 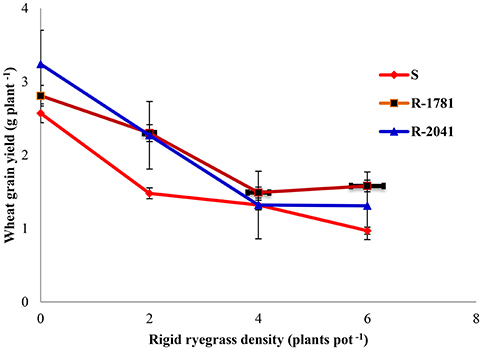 Evaluation of the competitive ability of R and S L. rigidum populations showed that increasing rigid ryegrass density from 2 to 6 plants pot−1 reduced wheat height compared to the non-competitive conditions (Figures 4A,B). The results showed that interspecific competition (rigid ryegrass-wheat) was more intense than the intraspecific competition (rigid ryegrass-rigid ryegrass or wheat-wheat). Figure 4. 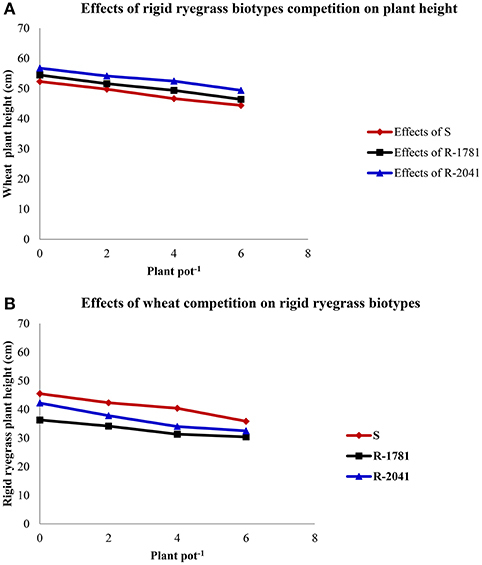 Effects of rigid ryegrass density on wheat height (A) and effects of wheat density on rigid ryegrass height (B). It has to be noted, that in our study wheat emerged 2–5 days earlier than rigid ryegrass. Consequently, this early emergence of Triticum aestivum allowed its high biomass accumulation, and therefore its competitiveness was high. In Australia, Rerkasem et al. (1980) found that the competitive ability of rigid ryegrass under field conditions was low when rigid ryegrass emerged later or simultaneously with wheat. Early wheat emergence in comparison with weeds is considered to increase wheat competitive ability as previously reported by Kropff et al. (1992) and O'Donovan et al. (1985). Our experiments also showed that a density of 2–6 wheat plants pot−1 decreased SDW per plant of rigid ryegrass at different densities (data not shown). As shown in Figures 4, 5, increased wheat density seems to increase the competition against rigid ryegrass populations which may be due to the dense wheat canopy and reduction of the availability of light, nutrients, and moisture for rigid ryegrass (Tanji et al., 1997). In another study and by using different rigid ryegrass densities in a field in Australia, Medd et al. (1981) found that SDW of rigid ryegrass in the presence of 40 or 74 wheat plants m−2 was twice that obtained in the presence of 200 wheat plants m−2. These findings agree with the results of our study showing that all densities of rigid ryegrass (2, 4, and 6 plant per pot) reduced SDW of wheat and grain yield per pot−1 (Figures 5, 6). Figure 5. Replacement series diagrams for shoot dry weight of ACCase inhibitor-resistant (R-2041 and R-1781) and -susceptible (S) rigid ryegrass biotypes grown under competitive conditions at different proportions with wheat. Figure 6. Effect of wheat and rigid ryegrass density on wheat grain yield. Vertical bars indicate standard errors of the mean (data from both years were combined, since there were not significant differences between the years). When populations R-1781, R-2041, and S were sown under competitive situations with wheat, their dry weight and height were significantly affected (Figure 5). SDW of the S biotype confirmed the theoretically anticipated response showing the fitness cost of R-1781, R-2041, biotypes. Dry weight and plant height of R-1781, R-2041, and S biotypes were different from non-competitive situation, being various in all studied proportions (Figures 4A, 5 and Table 4). Table 4. 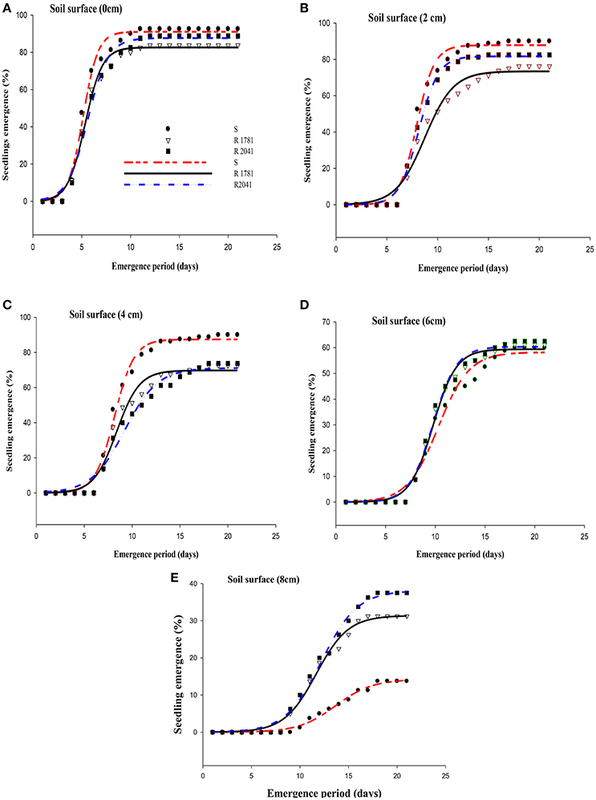 Shoot dry weight (SDW), number of tillers, and plant height for ACCase inhibitor-resistant (R) and -susceptible (S) rigid ryegrass biotypes in a replacement series experiment at five proportions (100:0, 75:25, 50:50, 25:75, 0:100) of (ryegrass:wheat). Gill et al. (1996) stated that there was not any significant fitness cost of rigid ryegrass resistant to ACCase inhibitor herbicides. A similar result was found in foxtail millet, Setaria faberi populations (Wiederholt and Stoltenberg, 1996), but in these two studies mechanism of resistance of these grass weeds to herbicides was not identified and this absence of fitness cost can be due to the involvement of several resistance mechanisms. Earlier studies on ACCase herbicide-resistant rigid ryegrass and blackgrass indicated lack of significant difference on the competitiveness between resistant populations with the ACCase 1781-Leu (R-1781) mutation and populations without this mutation (Menchari et al., 2008; Vila-Aiub et al., 2015b). Such studies highlight the need of the detailed knowledge of resistance mechanisms and of any mutations in order to correlate them with fitness cost data. Our results revealed a significant fitness cost in terms of plant growth and seed production of a R-1781 rigid ryegrass population and this finding is not in agreement with results of previous studies (Vila-Aiub et al., 2005; Yu et al., 2010). Furthermore, Vila-Aiub et al. (2005) correlated fitness cost with increased herbicide metabolism (HM), while there was any further fitness cost in plants with both increased HM and R-1781 mutation. In our study, S plants grew faster than R-1781 seedlings, matured, and flowered earlier and eventually produced more tillers and more seeds than the R-1781 plants. There was a tradeoff between tiller and seed production on the one hand and seed weight and seedling emergence on the other hand. Moreover, this is the first study with herbicide-resistant plants showing that different mutation can be responsible for the different competitive ability of R plants (2041-Asn plants exhibit better fitness ingredients than S and R-1781-Leu ACCase counterparts in some traits). So far, only a few studies have been conducted on the evaluation of fitness costs associated with 2041-Asn ACCase. A R-2041 biotype of Alopecurus myosuroides showed a fairly decreased enzyme activity (Délye et al., 2003). R-2041 has been observed in two grasses species: ryegrass (Délye et al., 2003; Zhang and Powles, 2006; Yu et al., 2007) and wild oat (Liu et al., 2007). The results of the present study also confirmed that there was any fitness cost on plant growth or seed production connected with R-2041 in L. rigidum plants grown in competition with Triticum aestivum. According to our results, seed size in the susceptible biotype was smaller than that of the resistant biotypes and this can result to lower seed survival and lower emergence rate especially for seeds sown at the 6–8 cm depth. This observation can be of high ecological importance, since it seems that R biotypes in some cases do not have any fitness penalty but also can germinate and emerge even from higher soil depths. On the contrary, the lower emergence potential of seeds of S populations is counterbalanced by their higher seed production. In previous studies on the identified R-1781 ACCase mutation, it was shown that the R biotype had slower germination than S plants (Vila-Aiub et al., 2015b). The present study provides some valuable information that will be useful for predicting the evolutionary dynamics of resistant populations and also for devising appropriate resistance management strategies. More studies on additional R and S rigid ryegrass biotypes need to be conducted, since previous studies on L. rigidum have found that high variability occurred in R and S biotypes regarding their relative growth and phenological development (Gill et al., 1996). Furthermore, since these experiments were conducted under well-watered conditions in a greenhouse, extrapolation of the results under field conditions may be limited and should be clearly investigated. In all cases, evaluation of fitness costs associated with herbicide- resistance genes is useful to parameterize modeling herbicide resistance (Gressel and Segel, 1990; Maxwell et al., 1990; Yanniccari et al., 2016) and provide an evolutionary frame for answering basic questions about the fitness cost in plants (Vila-Aiub et al., 2009, 2015a,b). Eventually, evaluation of fitness cost status associated with ACCase resistance in Lolium rigidum may be exploited in terms of the development weed management strategies. Anonymous. (2004). Herbicide Resistance Action Committee. Available online at: https://www.plantprotection.org (Accessed October 11, 2004). Alcocer-Ruthling, M., Thill, D. C., and Shafii, B. (1992). Differential competitiveness of sulfonylurea resistant and susceptible prickly lettuce (Lactuca serriola). Weed Technol. 6, 303–309. Christoffoleti, P. J., Westra, P., and Moore, F. (1997). Growth analysis of sulfonylurea-resistant and susceptible kochia (Kochia scoparia). Weed Sci. 45, 691–695. Gill, G. S., Cousens, R. D., and Allan, M. R. (1996). Germination, growth, and development of herbicide resistant and susceptible populations of rigid ryegrass (Lolium rigidum). Weed Sci. 44, 252–256. Gressel, J., and Segel, L. A. (1990). Modeling the effectiveness of herbicide rotations and mixtures as strategies to delay or preclude resistance. Weed Technol. 4, 186–198. Heap, I (2016). The International Survey of Herbicide Resistant Weeds. Available online at: http://www.weedscience.com (Accessed July 10, 2016). Heap, I., and Knight, R. (1982). A population of ryegrass tolerant to the herbicide diclofop-methyl. J. Aust. Inst. Agric. Sci. 48, 156–157. Kropff, M. J., Weaver, S. E., and Smiths, M. A. (1992). Use of ecophysio-logical models for weed-crop interference: relations amongst weed density, relative time of emergence, relative leaf area, and yield loss. Weed Sci. 40, 296–301. Maxwell, B. D., Roush, M. L., and Radosevich, S. R. (1990). Predicting the evolution and dynamics of herbicide resistance in weed populations. Weed Technol. 4, 2–13. Medd, R. W., Auld, B. A., and Kemp, D. R. (1981). Competitive interactions between wheat and ryegrass. Proc. Austr. Weed Conf. 6, 39–43. Moss, S. R., Clarke, J. H., Blair, A. M., Culley, T. N., Read, M. A., Ryan, P. J., et al. (1999). “The occurrence of herbicide-resistant grass-weeds in the United Kingdom and a new system for designating resistance in screening assay,” in Proceeding of the Brighton Crop Protection Conference on Weeds (Hampshire: BCPC), 179–184. O'Donovan, J. T., de St Remy, E. A., O'Sullivan, P. A., Dew, D. A., and Sharma, A. K. (1985). Influence of the relative time of emergence of wild oat (Avena fatua) on yield loss of barley (Hordeum vulgare) and wheat (Triticum aestivum). Weed Sci. 33, 498–503. Purrington, C. B., and Bergelson, J. (1997). Fitness consequences of genetically engineered herbicide and antibiotic resistance in Arabidopsis thaliana. Genetics 145, 807–814. SAS Institute (1987). SAS/STATTM Guide for Personal Computers, Version 6.0. Cary, NC: SAS Institute Inc., 1028. Tanji, A., Zimdahl, R. L., and Westra, P. (1997). The competitive ability of wheat (triticum aestivum) compared to rigid Ryegrass (Lolium rigidum) and Cowcockle (Vaccaria hispanica). Weed Sci. 45, 481–487. Thompson, C. R., Thill, D. C., and Shafli, B. (1994). Growth and competitiveness of sulfonylurea-resistant and -susceptible kochia (Kochia scoparia). Weed Sci. 42, 172–179. Wiederholt, R. J., and Stoltenberg, D. E. (1996). Absence of differential fitness between giant foxtail (Setaria faberi) accessions resistant and susceptible to acetyl-coenzyme A carboxylase inhibitors. Weed Sci. 44, 18–24. Copyright © 2016 Sabet Zangeneh, Mohammaddust Chamanabad, Zand, Asghari, Alamisaeid, Travlos and Alebrahim. This is an open-access article distributed under the terms of the Creative Commons Attribution License (CC BY). The use, distribution or reproduction in other forums is permitted, provided the original author(s) or licensor are credited and that the original publication in this journal is cited, in accordance with accepted academic practice. No use, distribution or reproduction is permitted which does not comply with these terms.